Eight days after Hurricane Katrina's devastating collision with the Gulf Coast on August 29, University President William P. Leahy, SJ, announced that Boston College had accepted 150 visiting undergraduate students whose fall semesters at New Orleans colleges were canceled. Most came from Loyola and Tulane universities. The students were enrolled on a nonmatriculating basis in the Woods College of Advancing Studies. In addition, BC Law enrolled seven second- and third-year students, and the graduate schools of social work, education, and management took in 10 students. The University has waived tuition for the New Orleans students, who may remain at BC until their schools reopen. Any who wish to stay beyond that time will need to apply for transfer. Working on a fast track with Boston city officials, including Mayor Thomas Menino, the University secured permits to house 100 students in St. William's Hall, on the new Brighton Campus. Once home to a seminary, the steepled building has served as a retreat site for priests and as office space. Facilities Management and Residential Life staffs worked quickly to ready the rooms. "It's really amazing what they did for us," Tulane junior Kevin Doyle told BC's Chronicle. When the students arrived, they found name tags on their doors modeled on the Louisiana license plate. CELEBRANTS led prayers for the Gulf Coast victims of Hurricane Katrina at every campus Mass during September. Support came in other forms as well. On September 10, more than a hundred volunteers with buckets (organized by the undergraduate student government and University offices) took a collection for hurricane relief at the BC-Army football game. They raised some $23,000. IN THE DAYS following the storm surge, Derrick Evans '90, MAT'94, a lecturer in the black studies program, led a convoy of three 26-foot trucks from Boston to his hometown of Turkey Creek in Gulfport, Mississippi. He had learned from a Mississippi neighbor's crackling cell phone call following the storm that many of the one-story bungalows in this historic African-American community, settled in 1866 by a group of emancipated slaves, were flooded up to the rafters. His 70-year-old mother phoned to tell him she had been rescued from her front porch by two neighbors with an air mattress. Five days after the disaster, no one in his hometown had seen any sign of FEMA or the Red Cross. Evans, who had planned to teach at BC this fall, instead organized an emergency supply run to Mississippi. He gathered a small group of volunteers, including two BC students, Seye Akinbulumo '07 and Jose Lopez '05, M.Ed. '09, who helped drive and fill his small fleet of rental trucks with supplies. Two of the vehicles—a moving van and Evans's pickup truck—became their headquarters, jury-rigged with laptops, cell phones, and wires to maintain communication with the outside world. After four days, they arrived in Turkey Creek with hundreds of gallons of water, a trailer carting barrels of gasoline, pallets of canned food, roofing materials, tarps, generators, and crates full of duct tape and other necessities—all supplied by Evans and his volunteers. "The relief effort unfolded in phases," said Evans, who has remained in Turkey Creek since he arrived in early September. "Once we provisioned our community, we joined forces with other local organizations to shuttle supplies to neighboring areas." 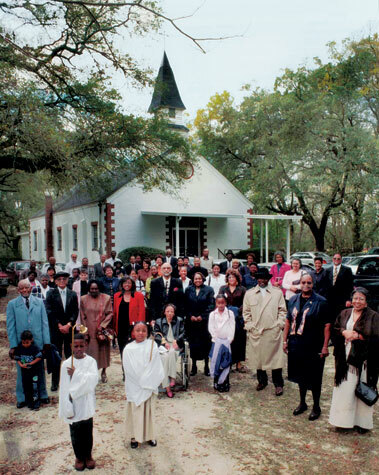 Eventually, Evans's own nonprofit, the Turkey Creek Community Initiative (TCCI), founded several years before Katrina, began to coordinate much of the work. Dedicated to preserving the area's history and promoting its economic, cultural, and ecological development, TCCI grew out of Evans's own initial academic interest in the community. Three years ago, after returning to Turkey Creek to film a historical documentary, he found himself becoming part of the story as he involved himself in local politics. Six months later, he founded the nonprofit, and has since become one of the community's most vocal advocates, commuting regularly between Boston and the Gulf Coast. "When you see a hole that only you can plug, you fill it," said Evans, who sends his thanks to all the members of the BC community who have sent donations, labor, and support. "I'll be here filling it for some time." ON SEPTEMBER 1, Boston College Magazine sent an e-mail to approximately 400 alumni along Katrina's path, inviting them to share their circumstances. Messages began arriving within hours: "I evacuated the day before Katrina hit the New Orleans area," wrote Evan Gwyn '04, a med student. "We have been moving around the past few days but will be going tomorrow to Lafayette, LA, where my family has rented a house. . . . Thank you for your concern." Some correspondents who'd been spared the worst sent offers of housing. Some sent photos—Elizabeth Stowe '05, a teacher, provided one of her school in ruins in Pascagoula, Mississippi. 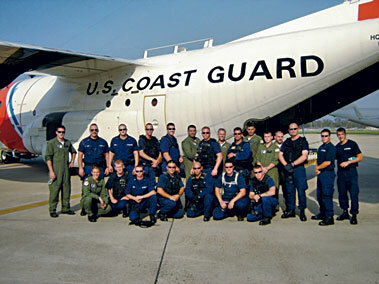 Lt. Ryan Elissa MacLeod '98 (USCG) included one of her crew in front of a Hercules C-130. "I flew over the area as the first airborne communications platform and command and control center for all of the rescue helicopters on scene the very first night," she wrote. New Orleans's Tess (Posch) O'Neill '76, a nurse, described working at a Red Cross center near Baton Rouge, adding, "We heard that our house came through unscathed . . . but [fear it] will fall prey to looters. . . . Please pray for all of those who have been affected. This is our tsunami." The e-mails may be viewed at bcm.bc.edu/katrina.